Some of the solar panels installed on buildings at the Maine Organic Farmers and Gardeners Association fairground in Unity. 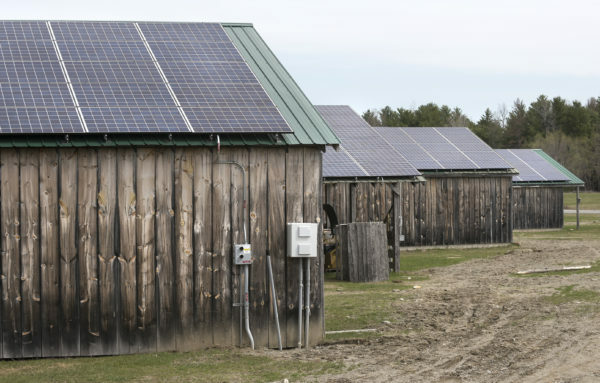 Electrical lines leading to some of the solar panels installed on buildings at the Maine Organic Farmers and Gardeners Association fairground in Unity. UNITY, Maine ― Attendees of this year’s Common Ground Country Fair in September may notice something new atop the five animal barns on the Maine Organic Farmers and Gardeners Association’s campus. And no, it’s not a new species of barnyard bird. It’s a newly installed series of solar panels that together make up a 102-kilowatt solar power array. MOFGA anticipates that this latest installation of solar technology will make the organization energy independent, an end that not only benefits the organization’s energy costs but progresses MOFGA’s mission to be conscious of their environmental impact. MOFGA’s solar array was brought to life in conjunction with ReVision Energy, and is just one of the latest ways Maine organizations ranging from for-profit businesses to institutions of higher education are diversifying their energy portfolio to incorporate forms of sustainable energy. The motivations for utilizing some version of sustainable energy are both economic and ethical moves, according to Dylan Voorhees, climate and clean energy project director at the Natural Resources Council of Maine. As the costs of renewable energy technology decreases, Voorhees said more and more institutions are seeing the light when it comes to being more sustainable. While many organizations are installing eye catching sustainable energy solutions such as solar panels or biomass heaters, Voorhees said many institutions are also implementing “less glamorous” forms of energy efficiencies, such as replacing fluorescent light bulbs with LED light bulbs or installing heat pumps. For MOFGA, achieving energy independence on its Unity campus has been the goal since it moved to the location in 1998, and “over the years there’s been a number of green systems installed,” Tessier said. Aside from the most recent solar installation, MOFGA’s campus also has an existing smaller solar array that heats the water for a sprinkler house, as well a 10-kilowatt wind power generator. The new solar array is slated to save MOFGA about $20,000 a year in energy costs. The installation is paired with the addition of 23 heat pumps across the campus’ buildings that will be powered by the solar panels. While MOFGA would’ve liked to achieve energy independence on it’s campus earlier, Tessier said there were several barriers, with financial feasibility being chief among them. 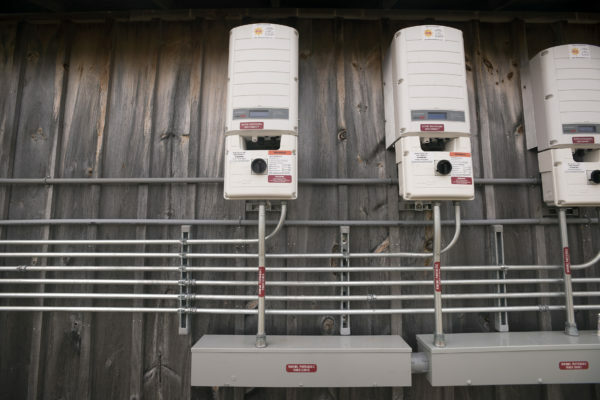 However, with the cost of solar technology decreasing in recent years, MOFGA was able to strike an agreement with ReVision Energy to bring their energy independence into reality. MOFGA is in a leasing agreement with ReVision energy, and plans to purchase the system outright once the agreement expires. 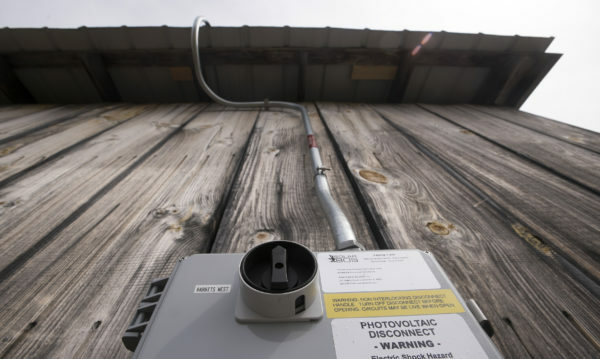 The contentious climate surrounding solar power in Augusta with that state’s utility regulators reducing the net-metering credits solar users receive earlier this year, was also an incentive for MOFGA to install the solar array sooner rather than later. Since education is central to MOFGA’s mission, Tessier said the organization also hopes to serve as a source of knowledge and a leading example for how it’s members and the greater public can implement this sustainable technology on a personal scale. “I can’t even count the number of telephone calls [we’ve received] and people asking how they can do this themselves,” Tessier said. Maine’s colleges and universities have been a leader in implementing sustainable energy solutions on their campuses. At the University of Maine at Farmington, a biomass heating plant has been providing heat for 26 buildings on campus for a little over a year, replacing about 390,000 gallons of heating oil annually. In addition to the biomass plant providing benefits for UMF, it’s also benefiting the local economy, with all of the wood used to power the plant being sourced from within 50 miles of the facility, according to Jeff McKay, director of facilities management at UMF. Since the biomass plant has been online, it’s also been incorporated into class curriculum. The buildings that aren’t heated by the biomass facility are heated using geothermal energy, meaning that the only heating oil UMF is using is in situations when the biomass plant is not producing heat, such as when it is being maintenanced or cleaned. Paired with other efficiency upgrades that facilities management has made to campus buildings, McKay said the biomass plant is overperforming initial expectations. With sustainability at the forefront of UMF’s thought process, McKay said other energy upgrades to the campus have included the conversion of the President’s House heat system from oil to wood pellets and conversion of fluorescent lights to more efficient LED lights. “Every single time we’re doing a project energy efficiency and sustainability are right on the forefront of our decision-making,” McKay said. At Colby College in Waterville, a portion of the school’s heating oil needs has also been replaced by a biomass heating plant that was brought online in 2012. Farms across the state are also hopping on board with the solar power wave. In Aroostook County, Smiths Farm, the largest producer of broccoli and cauliflower in the Northeast, is using a large solar installation to cover the electricity the farm’s cooling and packaging facility requires. “We wanted to do what we could to be more efficient and sustainable,” Emily Smith, president of the sixth generation family farm, said. The 205-kilowatt array provides about a quarter of the company’s overall electric needs. Smith said the company has also worked with Efficiency Maine to retrofit their cooling and electric systems to be more efficient. Other Maine family farms are also adapting solar, while on a smaller scale compared to the Smiths Farm array. In Dresden, Jan Goranson and Rob Johanson have added a 25-kilowatt solar array to their farm, Goranson Farm. The motivation to add the solar array was not only to cut down the farm’s use of fossil fuels, but to add to the sustainable future of the farm, which they hope to pass on to their two sons. At LaBrie Farms in St. Agatha, 300 solar panels were installed over a year ago to provide about 60 percent of the farm’s electricity needs. The specific ways in which each organization or farm or place of higher education are moving towards sustainability are as varied as the organizations themselves. But Voorhees said it’s the Maine value of environmental stewardship that links these projects together.